The Thursday before Thanksgiving break, Catholic University’s Piano Area, Art Department, and Music History Area came together to put on a celebration of Debussy’s piano music in Ward Hall. The concert featured twenty-four Debussy Preludes played by various piano students and faculty. Each piece was accompanied by artwork that drew inspiration from the images that Debussy evokes in his short but vivid piano pieces. Dr. Andrew Weaver, head of the university’s musicology academic area, began the evening with a short talk emphasizing the unusual ways Debussy has impacted music. “(Debussy) changes the way we hear and react to the traditional music language,” Weaver said. He demonstrated on the piano how Debussy surprises our ears by using scales that are not part of traditional music structures. Similarly, Debussy wouldn’t always end his pieces with conventional formulas. Instead he dabbled with unusual and dramatic ways to cut off a piece, making his music more striking yet. Weaver then put Debussy’s artistic vision into greater context by comparing it to a contemporary genre of poetry: Symbolic French Poetry. These works of literature use concrete, rigidly deﬁned images to paint vague abstract pictures that are easy to interpret in a number of ways. Weaver read the audience some excerpts of French Symbolic Poetry, demonstrating how the authors use a number of unrelated images and ideas to create a story with no plot, but with a profound emotional impact. The pianists and artists who interpreted Debussy’s work eloquently conﬁrmed Weaver’s analysis of the music that it is abstract and unusual, but it paints unforgettable pictures. The various preludes, ranged from depictions of wind and snow to a celebration of Charles Dickens’ character Samuel Pickwick. As each pianist played his or her prelude, the piece of artwork encapsulating the meaning of the piece appeared on the screen next to the piano. These works were all collages, borrowing ﬁgures, scenes, and faces from well known works, and mixing them with other images and colors to create pieces that were almost as abstractly evocative as the music. The artwork included images such as glasses of spilled wine, three young women dancing against the backdrop of the planets, and a winter sky that seemed to swirl on forever. These works were very much in the spirit of Debussy in the sense that they rarely portrayed exactly what the title of the song suggested. They seemed offbeat at ﬁrst glance, but sometimes through an abstract harmony of unrelated images, put together in an unexpectedly sensible arrangement, the paintings got even closer to the image of the song than the title did. The paintings brought out the quaint intricacies of the pieces. Since Debussy’s music has a bit of a wandering quality, the tunes are not often memorable, but the disjointed pieces of each song are still vivid and interesting. Listening to a Debussy piece feels like a road trip through various distinct, but beautiful scenes that ﬂow gently into each other. His choice to employ unconventional scales and other unique musical techniques, sometimes makes Debussy’s music seem unfulﬁlled. Yet somehow his use of dynamics, the entire range of the keyboard, and vivid moments of aural imagery, leave listeners feeling relaxed and tranquil. Debussy’s music is both daring and high caliber enough to marry those two opposite feelings with ease. The listener can understand this paradox at its best in standout pieces such as “Footsteps in the Snow” played by Elisa Barile, or in “What the West Wind Saw”, played by Garret Harmon, whose mastery over the intricate techniques required by this piece made him a standout performer. 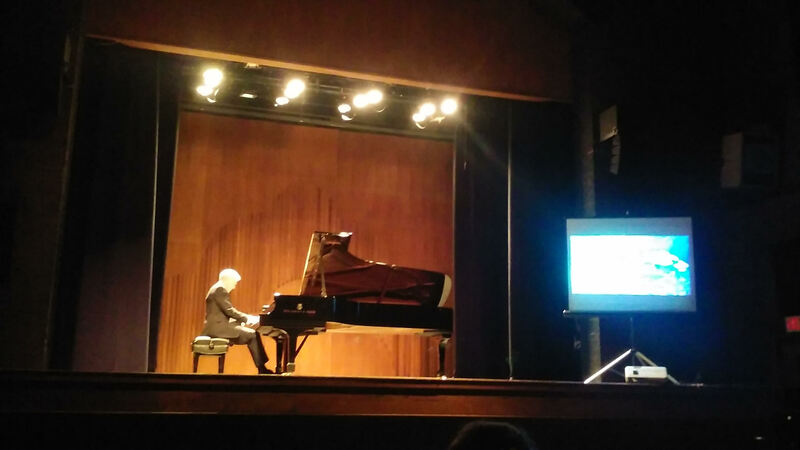 Throughout the concert the mood went from one of contemplation, to outright joy, as best exempliﬁed in Dr. Nikita Fitenko’s piece “Minstrels”, whose infectious delight at the keyboard made his performance one of the most approachable on the program. The Debussy Concert was the first collaboration between the Art Department and the Piano and Music History Areas of the Rome School. Appropriately enough, this semester marked the start of the Rome School as a combined school of Music, Art, and Drama. With the school as one united artistic force, there will likely be many more events that showcase the powerful statement art can make when different mediums of art work together to bring the same message to audiences. At the Debussy Concert, the cross disciplinary nature of the concert brought out the evocative tone of Debussy’s music much more profoundly, and gave audiences the opportunity to appreciate Debussy’s vision on multiple levels.